Dual channel, 100W (or 50W), dual Master Volume, configurable response guitar amplifier. The Orthos™ amplifier was designed as a more streamlined version of the Gemini™. While there is no MIDI or advanced control built-in to this amp, there are still some cool features. For example, there are assignable Bright/Voice/Loop functions on each Master Volume setting, in addition to dual Gain controls. Built-in to this compact head is a 100W power section capable of running a number of different power tubes. A transparent, yet fully bypass-able, effects loop seamlessly couples the preamp to the power section. The Orthos™ amplifier consists of two channels, each with its own gain, 3-band EQ, various Bright/Voice/Loop assignment switches, and level controls. In addition, the Lead channel features dual Gain controls, one for Master 1 and the other for Master 2. This channel produces a wonderfully warm tone that aims to be the best of any channel switching amplifier. Where most other high gains amps seem to include a clean channel out of necessity rather than desire, the Orthos™ has a no-compromises clean channel with its own dedicated preamp tube voiced specifically for huge headroom and sparkling cleans. With the included Gain control on the clean channel, one can also dial in a very cool vintage style distortion. We include a Bright switch for each Master allowing you to add sparkle and clarity to the clean tones. Whichever Master is active determines which switch is used to activate the Bright function. Dual Loop switches are present on the Clean channel as a way of engaging/bypassing the effects loop for each Master. This allows you to easily engage the Loop automatically for one of the Masters. The Orthos™ Lead channel is based on our signature high-gain sound that aims to give you one of the most unique, round, warm, yet extremely usable and cutting high gain tones available. The Lead 1 and Lead 2 voicings from the Colossus are both available via the Voice switch. Lead 1 has a nice solid and tight mid voicing that is great for rhythms and leads alike. Lead 2 has a lower mid-point and is favored by most for smooth singing leads. The Lead channel sound is technically fixed to Colossus Mode On and Fat On. This is one of our most popular high-gain tones, and it made sense to build a stripped-down amp around it. This sound is great for metal and rock alike, depending on the overall Gain and Bright settings. We include both Bright and Voice switches for each Master allowing you to adjust attack and feel for rhythm and solo tones. Whichever Master is active determines which set of switches is used to activate the Bright and Voice functions. Dual Loop switches are also present on the Lead channel as a way of engaging/bypassing the effects loop for each Master. This allows you to easily engage the Loop automatically for one/both/neither of the Masters. The Orthos™ features the same proven transparent and wonderfully performing effects loop as our other amps. The loop circuit is true-bypassable via the front panel Loop assignment switches, as well as a rear panel 1/4″ contact closure jack. In addition, the loop has independent Send and Return Level controls for maximum flexibility. Dual master volumes allow for two overall performance levels to be set and recalled by the user. One player may prefer to set the second level as a solo-boost, others may prefer to use it as a volume cut. In addition, the current Master also selects the active row of assignment switches. Master 1 selects the top row of switches, Master 2 selects the bottom row. The master section also includes power amp response controls, Top and Bottom. The Top control affects the response of the power section to treble frequencies, whereas the Bottom control affects the bass frequencies. These controls are great for dialing in the amp’s response to different speaker cabinets. They also allow the player to optimize the amp for different master levels. It’s especially useful for adding awesome bottom and clarity end at low volumes. 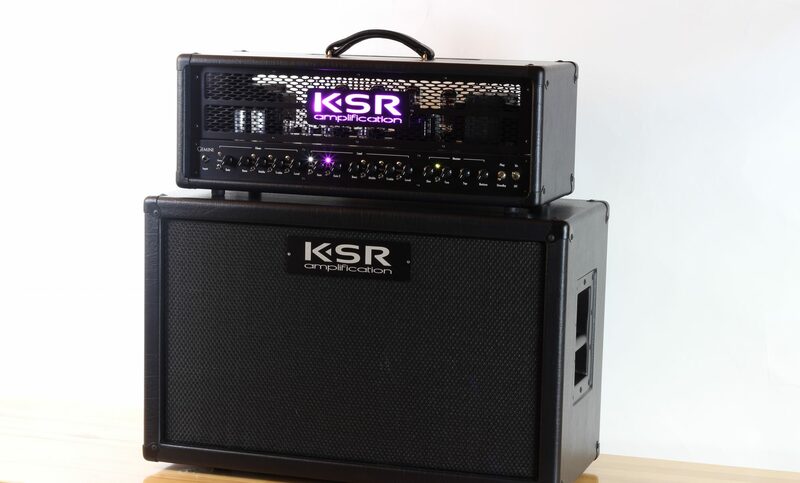 Either a lit acrylic, metal lit, or standard solid logo is available on the face plate of the amplifier. The lit logos are capable of displaying any color for a number of different amp settings. This is all programmable via a DIP switch system on the back of the amp. A different color can be selected for each of the 4 settings Clean Master 1, Clean Master 2, Lead Master 1, and Lead and Master 2. A custom foot switch is included with the Orthos as an option. Further, the amp is compatible with any standard 2-button 1/4″ TRS foot switch. In addition, control of individual functions is possible via standard 1/4″ contact closure connections on the back of the amp. Note: Once a jack is plugged into one of the rear panel control functions, the respective function is defeated and the plug takes priority. This means if the foot switch is plugged in, the front panel Channel / Master controls will no longer function. Dimensions: 26.75in. × 11in. × 9.5in. The Orthos 50C is the greatest amp I have ever owned.